Guest accounts allow temporary login on a Windows system without requiring to provide credentials/password. Each system administrator would have a different need on how to configure guest account on their systems. This post explains how to enable or disable guest account on a Windows computer. Firstly, let’s see how we can check if guest account is enabled/disabled. net user command with a string search using findstr helps to know the status of guest account. net user guest | findstr /C:"active"
c:>net user guest | findstr /C:"active"
Open elevated administrator command prompt and run the below command. Here’s the command to disable guest account on any Windows version/edition. The above commands would work on Windows 7, Windows 8 and also on older versions like XP, Server 2003 etc. 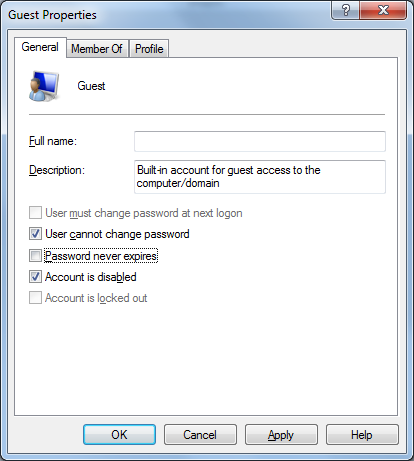 Alternatively, we can enable or disable guest account from GUI using the user management console. Run the command ‘lusrmgr.msc’ from Run window, enter administrator credentials and go to the node ‘Users’ in the console. Open the guest account properties and then select / unselect the check button ‘Account is disabled’. Is it possible to delete guest account? If you are never going to use the guest account, you may be thinking to delete it permanently from your system. However, Windows does not allow to delete guest account, for the fact it does not allow deleting any built-in accounts like administrator. Here’s sample run on my Windows 7 box. System error 1371 has occurred. Cannot perform this operation on built-in accounts. Good tip. Helped me to enable guest account on windows 7 machines from a batch file. Thanks. I could disable guest account from cmd on my windows 8 system. I am getting the below error when I tried this command. Mike, you will want to run CMD as an elevated user, right click and press “Run as Administrator”. you are using command prompt as a non-admin user, as Adam said, you can use “Run as Administrator” or open your administrator account and do it. I’m having the same problem as Mike here, though i did run CMD as admin. OS: Win 10 Home (free upgrade from Win 7 Home Premium), under local account because I REFUSE to make it easier for MS to snoop in my computer. I have deleted my default administrator account how can I fix it?